In the mid to late 1800s, Scranton, Pennsylvania was known the world over as an industrial hub; home to coal mining, innovations in electric power, and iron works. Since then, Scranton has moved away from its industrial roots, and many of the old buildings, factories, and railroads are left to molder and rust beneath the ever-changing NEPA weather. 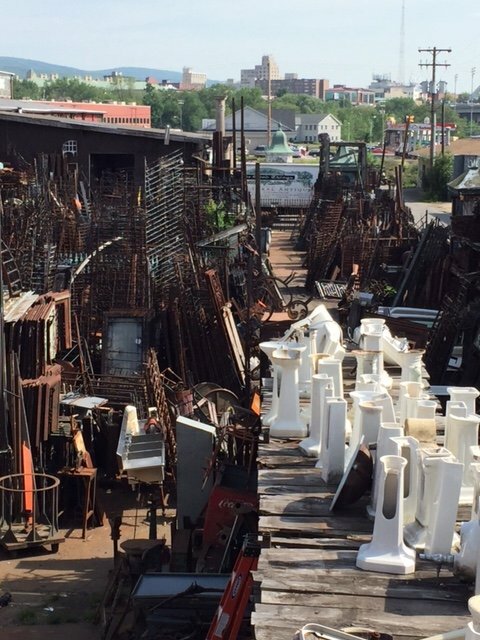 If you’ve ever visited our Scranton, Pennsylvania location, you’ve probably been awed by our vast yard filled to exploding with iron fencing and railing. 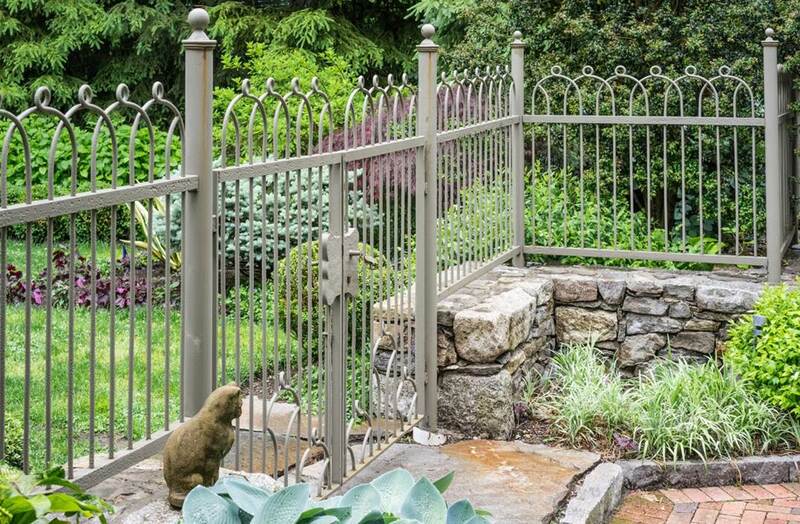 OGT has spent many hundreds of hours salvaging wrought iron, hand-hammered iron, and industrial iron from buildings across the country—so much so that many of our customers are overwhelmed by the vastness and the variety of styles available. At OGT we know that just because something looks old or broken it doesn’t mean it can’t come to life again. 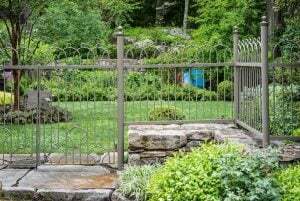 Old rusty iron gates or railings don’t have to stay rusty, and they don’t have to just be gates or railings! You can repurpose exterior railings or gates for interior redesign projects. 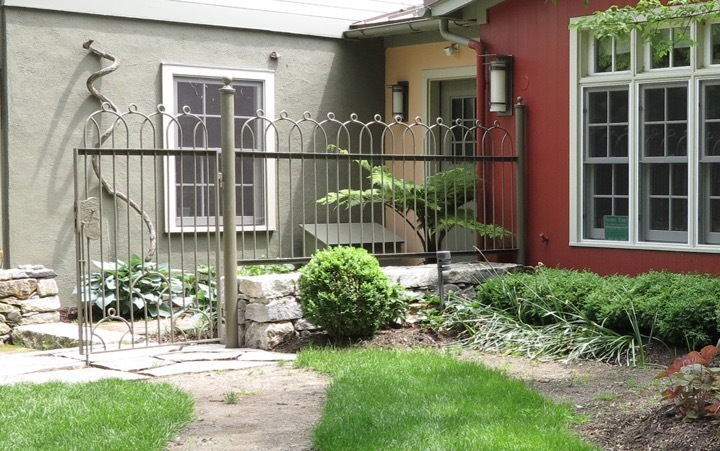 A section of old railing can be sandblasted and painted and installed as the railing for a balcony. 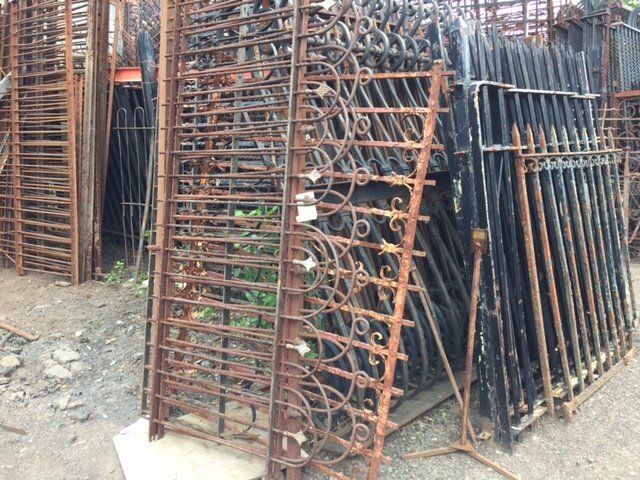 Or a pair of old iron gates can be cleaned, welded together, and reused as a partition to break up a large space. Here you see just one of those varieties – some very simple hoop and loop style fencing. One of our customers knew this was the look they wanted for their outside terrace and garden of their home. Once it was simply a section of salvaged fencing in our vast yard and now sandblasted and refinished – it is set up and installed at their home. Take a look for yourself. Iron has strength, and once heated and crafted by master iron workers, it can become something beautiful. If your garden is a whitewashed ‘blah’ of stone, why not add an iron trellis; leafy vines and vining flowers weaving with your reclaimed iron to create a breathtaking conversation piece. 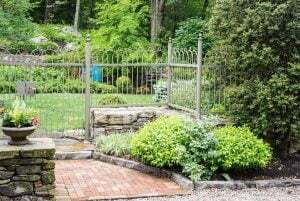 A reclaimed and cleaned iron gate can be the perfect addition to your outdoor entryways and walkways—secure, strong, and stylish. Not convinced? Visit our online inventory of iron fencing and railings here. Or take a tour of our Scranton, Pennsylvania warehouse location and see for yourself. Beneath the rust and years, these reclaimed iron pieces have a strength and beauty just waiting for you to uncover.